In any home, especially a small one, every inch of free space counts. Small shelves, tiny niches and other unique spaces can help accent a home in a tasteful, uncluttered way. By using the small spaces wisely and leaving the larger areas open, the living space will feel larger. You may think because a room is smaller, large furniture pieces are out of the question. That’s not necessarily true. Sometimes an oversized piece of furniture can give a small room a cozy and intimate feeling. The layout and size of a room will still determine how many pieces can comfortably fit. Small rooms pack more punch when the furniture and accessories are not only properly sized, but multifunctional. 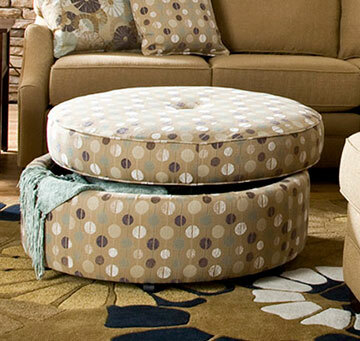 For example, ottomans can work as seating, occasional tables, desks, or storage. Suppose you need to transform a small study into a multipurpose space. Adding a sleeper sofa easily creates a guest room. An entertainment center or armoire stores the TV and other electronics. A console table can function as a convenient laptop desk and decorative boxes can be used for storage of office supplies. Lighting, glass, and mirrors can be used to create the illusion of more space in a room. Layering light sources gives a room a feeling of depth. It’s always good to have three different sources of lighting in the room, whether it’s a window, an up-light raking across the surface of screen or a floor lamp. These elements provide interest and de-emphasize the room’s small size. When it comes to accessories, it’s better to have a few large dramatic pieces than many small items, which make a space seem cluttered and collect dust. Sometimes a small vase, flower arrangement, or candle tucked into an angled corner will bring more interest to a room than a large arrangement on the living room table. This difference in your use of space can help you ensure that your home looks cozy without feeling cramped or overdone. Storage can be another issue in a smaller space – there just never seems to be enough. If you’re buying new furniture or deciding which pieces to use from your current home, look for pieces that can perform double duties. Rethink how and where you use your furniture. An armoire or chest intended for the bedroom can work very well the living room. They can provide storage for magazines, extra bedding, kitchen linen, or any of those pesky little things you just can’t seem to find a place for. Inexpensive storage boxes come in a variety of sizes. They can be stacked in a closet or tucked into drawers. If you invest in attractive boxes, baskets or hampers for extra storage can double as a room accent. Kids’ rooms are always in need of extra places for all their treasures. Bookcase headboards, drawers tucked under the bed, and loft beds are a great way to make use of every inch of space for storage while leaving plenty of room for play. Decorating a small space can be challenging, but with a little planning it can be just as beautiful as any large room in any large house or apartment. For a multi-tasking coffee table, look for one with a lift-top or one with drawers or shelves underneath. Substitute it with a cedar chest or trunk. Use mirrors and light-colored artwork to increase the light reflected in the room, opening up a small space and making it feel more welcoming. Decorative stacking boxes or even vintage suitcases not only provide storage, they’re also terrific accessories.